It’s now been over a month since CEO Sean McCarthy or any other member of Steorn has spoken publicly, to either the press or the forums. Whether they’re hard at work or falling apart, they’re just not talking. Given the silence from Steorn, some have wondered whether they’d packed up and cleared out. Forum member Crank, who lives a few miles from Steorn, dropped by their office on July 31st. She reported back that the situation there was normal, and all employees were still present. One older item of interest that came out recently is the design of the demonstration unit that Steorn intends to have manufactured in a limited quantity (100,000), to be sold off as part of the public introduction of the Orbo technology. The device, shown below, looks like a horsehead or “nodding donkey” style oil pump, sitting atop an oil barrel. 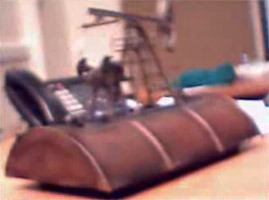 A video of this device in action was made available to the SPDC, however Sean stated that the motion of the prototype unit seen in the video was not actually generated by an Orbo. So, it proves nothing except that Steorn is laying plans for the public introduction of Orbo. And there’s a new Google discussion group, Steorb, devoted to Steorn. Not very active these days, but people can post there without fear of the occasional bannings and threads deletions that occur at the Steorn company forum. This period of silence from Steorn can only be the calm before a storm… but whether that storm will be a successful demonstration of free energy or just the collapse of the company, remains to be seen. 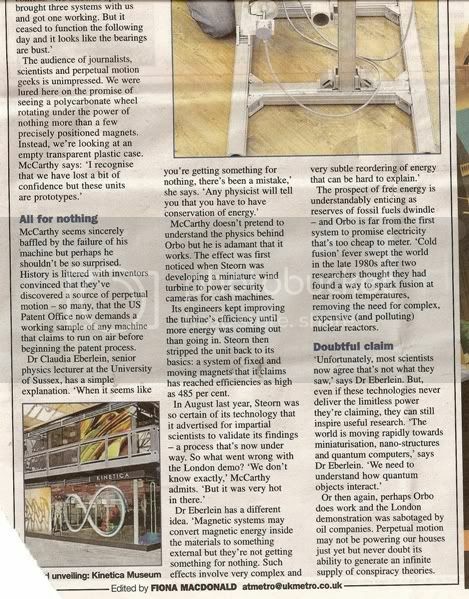 The Irish company Steorn claims to have developed a revolutionary technology for generating free energy: Orbo. Find the latest updates on this page, or get the story from the beginning here. Steorn's Orbo: Dispatches from the Future is written by Michael Ferrier, and is not affiliated with Steorn Ltd.